Park Place is quietly located in the almond orchards of Shafter California, just outside of Bakersfield. It is the perfect venue to hold your next company party, reunion, fundraiser or private party. We have a peaceful lake that quietly rests next to an open lush garden area and spacious banquet hall. Our signature water fountain in the center of the lake adds to the charm and serenity of our venue. 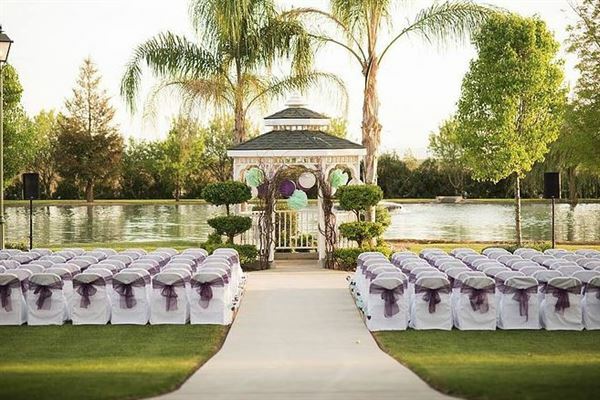 This is only one of the beautiful scenes you will see as you view Park Place’s idyllic natural surroundings and consider all the possibilities for your wedding or special event. Built in 2007, our banquet room can hold up to 325 people, and even more while utilizing the outside spaces. The banquet hall features floor to ceiling glass doors which open up to create a seamless transition from inside to outside. The hall has both heating & cooling, making it available to be used all year long. The space is very versatile, so no matter the size, type or style of your event, it will suit your needs. Our banquet hall is very spacious and is surrounded with floor to ceiling glass doors which open up to create a seamless from transition from an outdoor ceremony to an indoor reception. The banquet room is a versatile area which has both heating & cooling making it available to be used all year long.